We are fortunate indeed to have a demanding martial arts practice that continually challenges us to maintain this mentality. 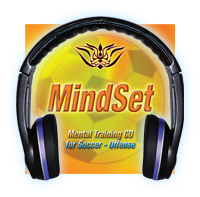 Sport psychology methods used by US Olympic athletes provide an opportunity for us to build this goal-directed, optimistic mentality outside the dojo. One such method is the daily use of a custom made audio CD that guides us to mentally rehearse our ideal karate practice. The CD consists of two tracks. The first is a four minute relaxation exercise that allows us to focus inward (much like the meditation at the start of practice), and achieve a comfortable state of restful alertness. The second track is a fifteen to twenty minute carefully worded narration that 1) reminds the athlete of his/her goals, 2) guides the athlete to mentally rehearse the specific actions important in reaching those goals, and 3) reaffirms the athlete’s key beliefs about him or herself that build the confidence and trust needed to persevere with training and achieve the goals. 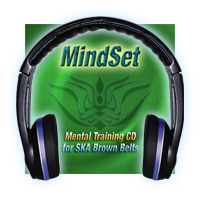 By regularly listening to these tracks, the athlete (and the karateka) develops a stronger sense of purpose, a clearer understanding of the path to be followed, and a greater degree of self-confidence. 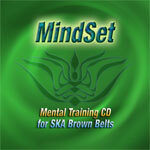 Each CD is professionally made, studio quality, and features a music background of Japanese Taiko drums that help create a strong martial feeling.